…but today the win was his. Orido fought very hard all the way but it went all out of the window for him when he put a rear wheel out on the dirt, losing the drift and allowing Tokita to pull away. Okayama Circuit has to be one of my favorite places to watch the D1-pros do their thing and this morning during the practice round a lot of drivers were going for those barely believable rear-first entries. Here is the man who started this technique, or rather made it famous, Kawabata, showing how it's done. 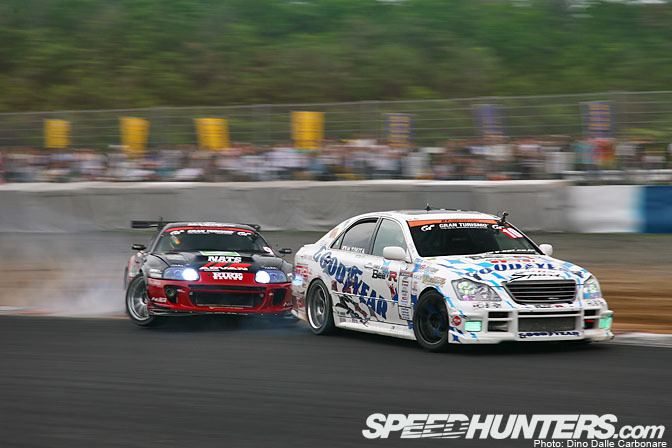 Big heavy cars like Daigo Saito's JZX100 aren't really suited for the rear-end entries, but this didn't stop him from trying. However it's his pedal-to-the-metal exits that always look so stunning. Imai-san of Bee-R was a very happy man! Thumbs up for sure! 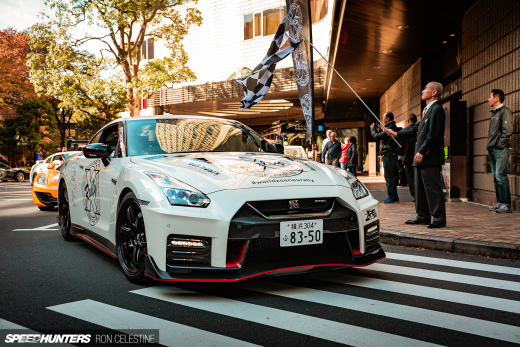 The Crown Zero-R, winner of Round 4. As Orido pulled up after messing up his last run he went to check out the rear end of his car to see if everything was still in one piece. I couldn't believe what I was seeing when this thing popped out of nowhere!! 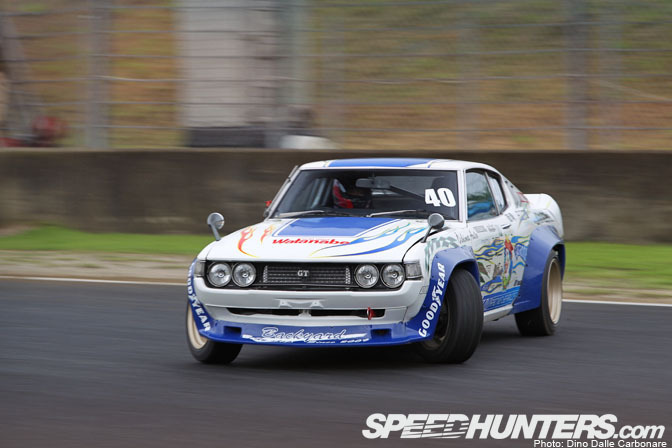 It is indeed a vintage RA28 Toyota Celica GT, running a Nissan SR20DET swap and driven by Itakura Hideo. These are the kind of cars we need to see more of in D1! The most original D1 car in years! Nomuken pulling one of his trademark poses. I really need to find out what this is all about! He was smoking in the qualifying round, but ended up losing his Best 16 battle against Tokita ending his chance at more points for this round. 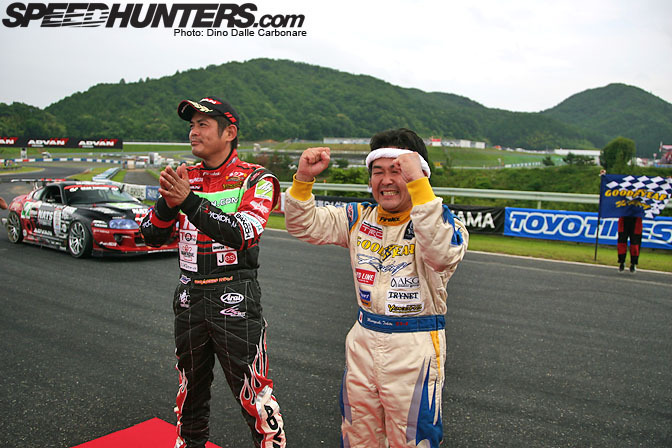 …much like Kumakubo who screwed up a gear-change in the qualifying run and allowed his car to straighten up. 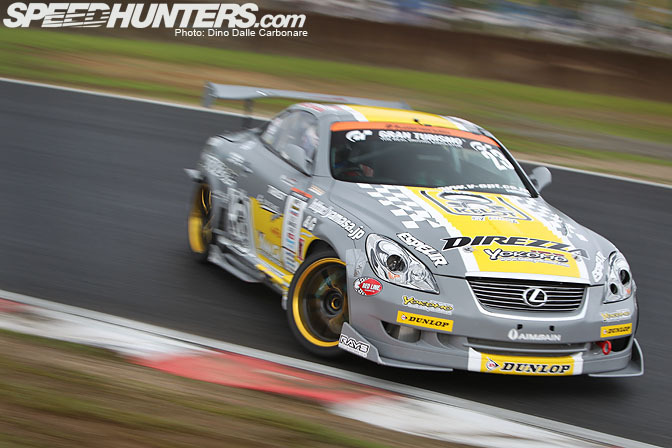 His teammate Naoto Suenaga of Team Orange however was on top form today, qualifying in 12th position. His day ended in the Best 16 up against Nakamura, after a series of one-more-times. I've got ton more images to share from Okayama, including a few more of those crazy rear-end entries, so make sure you check back soon for Part 2! Orido's car is just so nice. Finally Tokita gets the win! Thanks for the coverage. tokita looks so pumped lmao id love to win a D1 event with that barge he drives!!! If you're going to win a D1 event you might as well do it in style! Well done! Still no team orange Laurel? Love the Celica!!! Cool N2 flares. That Celica was the last year too and theres a lo of videos about that celica in hiroshima. But very very cool for Tokita a great men. "so make sure you check back soon for Part 2!" did the yellow jzx90 Mark II show up? 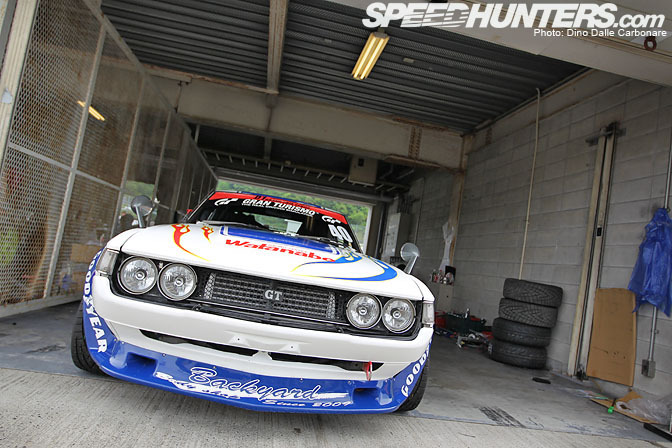 Please tell me that you're doing a feature on that Celica....it looks stunning!! desktop of the celica please. Awesome pics! Could we get a desktop of that Kawabata backwards entry?! Re: Nomuken pose. One needs to watch a Kamen Rider episode to find out. Is it just me, or is Kumakubo losing it? I'm psyched for Tokita, really I am, but I really wanted to see Monkichi pull this one out. 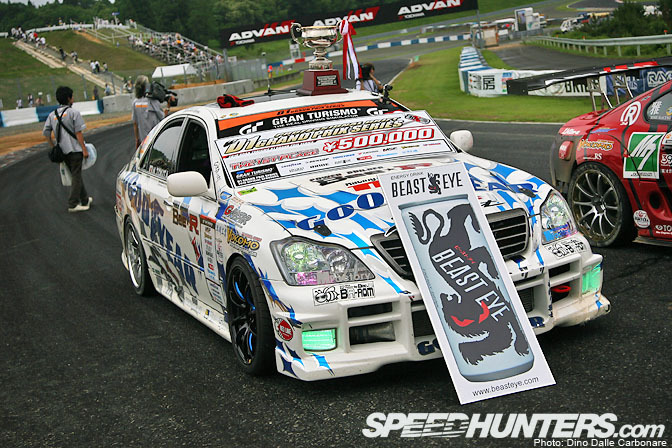 He lost it out to Kazama with a wreck in '05, and lost it here with a drop off in 2010. Does that mean we have to wait for 2015 for Orido to pull out a win? I hope not, ORIDO FTW. That Celica is awesome! Kudos to the guy with the balls to run it! I believe Nomuken is doing the Kamen Rider pose. Congrats Tokita! And....backwards entry? That doesn't even look close to last year, guys! WTF was that "pose" all about?! I died a little inside when I saw the sense of coolness the japanese folk have. Oh well, tolerance, I guess. 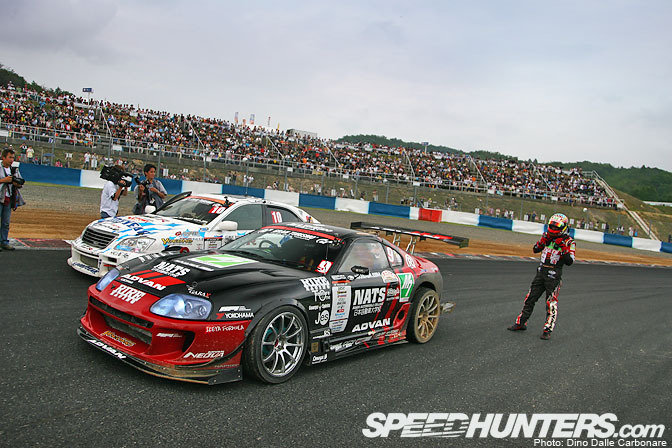 @ Henry: I was thinking the same thing about the fitment on the Supra but I believe there was an overfender that was ripped off the off road excursion.... and yes, more vintage drift cars, that RA28 is dope!!!!! Nomuken is coming to Norway 9-11th July! 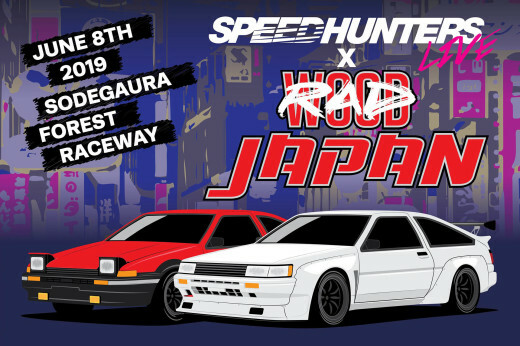 he will be a guest in my team TeamDriftMonkey!! Desktops of Kawabata and Nomuken's entries? @ Henry: Yup, it's like carlife86 said, the awful fitment look there is due to the dirt drop ripping off Orido's rear fender panel. If you look in the red design, there's a black difference there in the Advan scheme that's the shape of a Ridox panel. Nomuken has been doing that pose for years, and it has nothing to do with nazis. PLEASE don't start looking for that crud here, or start it.